Our special edition is a piece of the Allegiant Air MD-80 Tail #N892GA. Affectionately called the “Mad Dog”, the MD-80 has been critical piece of the carrier’s success since it started service 1999. Allegiant’s innovative business model, of which the MD-80 fleet played an important part, has helped take more than 80 million passengers to their destinations across the country. In commemoration of Allegiant’s retirement of the MD-80 as it transitions to an all-Airbus fleet, these plane skin keychains we commissioned to celebrate the aircraft’s nearly 20 years of service to the airline. 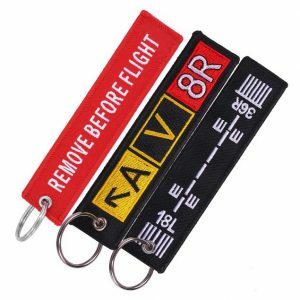 Plane skin keychains are made from actual retired aircraft fuselage, not merely stamped metal. Because keychains are made from real fuselage, each bears the color, thickness, and wear and tear from the portion of the fuselage from which it was cut and it is therefore rare to create two identical keychains.